I've been sick. Coughing and sneezing and sore throat-ing. The only thing I've done in the kitchen is make hot tea. With all this time spent resting on the couch, I've done a stupid amount of internet-recipe searching. I now have a long list of recipes to make as soon as I can breathe out of both sides of my nose. 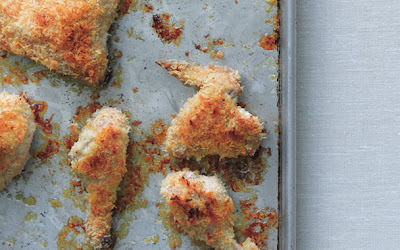 This Oven-Fried Panko Chicken from Gourmet.com (moment of silence for my favorite magazine that has shut it's doors) is first in the queue. Check out the video of the former editor making this chicken. 1. Preheat oven to 450°F with rack in middle. 2. Stir together panko, cayenne, 1/2 tsp salt, and 1/4 tsp pepper in a pie plate. 3. Stir together butter, 1/2 tsp salt, and 1 /4 tsp pepper in a small bowl, then brush all over chicken. Add chicken, 2 pieces at a time, to crumb mixture and coat evenly on both sides, pressing chicken into crumbs to help them adhere, then transfer, skin side up, to a shallow baking pan. 4. Bake chicken until well browned and cooked through, 30 to 40 minutes. Let stand, uncovered, 5 to 10 minutes to crisp.